HP , E.I. Du Pont de Nemours & Co, Mondi, Xeikon, and Xerox are the leading vendors in the global digital printing packaging market. CHICAGO, IL, UNITED STATES, February 4, 2019 /EINPresswire.com/ — The global digital printing packaging market is estimated to reach revenues of around $28 billion by 2024, growing at a CAGR of approximately 11% during 2018-2024. The global digital printing packaging market is driven by growing demand from various industries such as food and beverage, healthcare, electronics, and others. China, Germany, Japan, and India are emerging as the powerhouses in the global market. The market research report provides in-depth market analysis and segmental analysis of the global digital printing packaging market by technology, end-user application, package type, and geography. The report considers the present scenario of the global digital printing packaging market and its market dynamics for the period 2019−2024. It covers a detailed overview of various market growth enablers, restraints, and trends. The study covers both the demand and supply sides of the market. It also profiles and analyzes the leading companies and various other prominent companies operating in the market. The growing preference for enhanced product presentability across several consumer brands is driving the demand in the global digital printing packaging market. The appearance of the product often influences the buyer immediately, the first impression of the product will result in the ultimate purchase decision of the consumers. The companies are leveraging product packages to promote their products on digital media in the market. The rising demand for short-run product printing, variations in SKU (Stock Keeping Unit), and seasonal & one-off promotional packets is propelling the growth of the global digital printing packaging market. Digital printing helps reduce overhead costs and enhance productivity in the global market. The quality of this printing has a range of different impressions without any hurdles and provides the flexibility option by printing exactly the volume required to be printed in the market. The ability to print just-in-time quantities is one of the major benefits of digital technology in the global market. The rising demand from various industrial applications such as food & beverages (F&B), cosmetics, and healthcare industries is contributing to the revenues in the global digital printing packaging market. The increasing availability of various materials such as label packaging, folding cartons, corrugated packaging, and flexible packaging will contribute to the growing revenues. The inclination towards flexibility and convenience will contribute to the growing revenues in the global digital printing packaging market. The growing popularity of zip locks, resealable seals, and the reusability feature of packets will promote sustainability. This market research report includes a detailed segmentation of the market by technology, end-user application, package type, and geography. The global digital printing packaging market by technology is segmented into inkjet technology and electrophotography. Inkjet technology segment dominated more than half of the total market share in 2018, growing at CAGR of around 16% during the forecast period. Inkjet technology is one the latest and emerging trend in the global market. The inkjet systems have a certain single-pass system possess separate rows of different print heads for each color, thereby offering smoother and more precise label information in the market. Electrophotography is the most recognized and widely used solution in label packaging in the global market. The ability to produce top quality prints over a wide range of material substrates will boost the adoption of this technology in the global digital printing packaging market. The package type in the global digital printing packaging market is classified into labels, corrugated packaging, folding packaging, and flexible packaging. Corrugated packaging is the fastest growing segment in the global market, at a CAGR of approximately 12% during the forecast period. Corrugated boxes and cardboards are the most popularly used package in the global market. The presence of a diverse range of products catering to a wide range of industries is one of the primary factors contributing to the growth of this segment. Labels comprise of a broad range of details, and it has to contain precise and accurate information. The manufacturers are leveraging labels to enhance the products appeal, resulting in higher demand in the digital printing packaging market. The global digital printing packaging market by end-user application is categorized into food & beverage, electronics, healthcare, personal care, and others. Food and beverage segment occupied more than half of the total market share in 2018, growing at a CAGR of around 11% during the forecast period. The wide range of products and a shorter lifespan of consumer goods is propelling the growth of this segment in the global market. The rising demand for hand care, color cosmetics, face care, hair care, and body care products are boosting the growth of the personal care segment in the global market. The wide range of products catering to a large group of consumers will create lucrative opportunities for the vendors operating in the digital printing packaging market. The geographical segment in the global digital printing packaging market is divided into APAC, Europe, North America, Latin America, and MEA. APAC dominated the largest market share in 2018, growing at a CAGR of around 12% during the forecast period. The growing demand for innovative food and beverage and cosmetic product packages is driving the demand in the APAC market. Japan, China, India, and South Korea are the largest revenue generators in the APAC region. The exponential growth of the organized retail sector will drive the European market over the next few years. The rising employment, relaxed monetary policy stance, and a boost in investor sentiments are some of the major factors contributing to the development of the European digital printing packaging market.The European Union (EU) has initiated the Horizon 2020 program, which is the largest R&D funding and innovation program. The global digital printing packaging market is moderately fragmented due to the presence of top vendors commanding the competition level. The increasing focus on innovations and upgrades will intensify the competition in the global market. The leading vendors are a focus on quality, technology, and price to sustain the competition in the market. Large manufacturers are shifting and expanding their production facilities in emerging countries such as China, South Korea, Japan, India, and Taiwan in the global market. The introduction of many innovative and advanced solutions will boost revenues in the global digital printing packaging market. Other prominent vendors include Quad/Graphics, Cenveo, Dainippon Screen Graphics, EC Labels, Graphix Labels and Packaging, Edwards Label, INX International, Quantum Print and Packaging, Traco Manufacturing, CCL Healthcare, Heidelberg USA, Barberan, Cyan Tec, Hinterkopf, Minolta, WS Packaging Group, Krones, Hymmen, Landa Digital Printing, Mark Andy, and Sun Automation. 1. The analysis of the global digital printing packaging market provides market size and growth rate for the forecast period 2018-2023. 2. 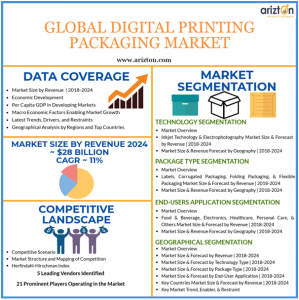 It offers comprehensive insights into current industry trends, trend forecast, and growth drivers about the global digital printing packaging market. 4. It offers a complete overview of market segments and the regional outlook of the global digital printing packaging market. Next Next post: Crane Worldwide Logistics Announces New Appointment in U.S.